Neptune's Ark illuminates the dramatic saga of evolution spanning 500 million years of marine life along the magnificent Pacific coast of western North America. In an engaging narrative that artfully blends elements of science, history, folklore, and personal observation, renowned naturalist David Rains Wallace reveals a marvelous diversity of creatures, not only modern ones, but those from the far prehistoric past. Mysterious forms have abounded—from giant sea cows, oyster bears, and flightless toothed birds to the orcas, elephant seals, and sea otters of modern times. Wallace tells a story about evolution as well as a tale of the storms, scurvy, and shipwrecks that plagued the coast's explorers, naturalists, and scientists, many of whom led turbulent or tragic lives, with themes reflected in the wonder and danger of the coast itself. 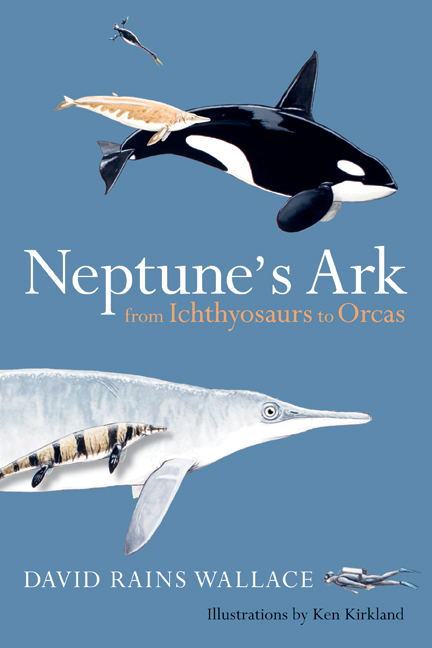 Neptune's Ark is full of vivid characters—from explorers like Sir Francis Drake and Captain James Cook, to pioneer naturalists including Georg Steller and Charles Scammon, to early paleontologists Othniel Marsh and Edward Cope, and to recent scientists and ecological visionaries. David Rains Wallace is the author of sixteen books, including Beasts of Eden: Walking Whales, Dawn Horses, and Other Enigmas of Mammal Evolution (UC Press), A New York Times Notable Book; The Klamath Knot: Explorations of Myth and Evolution (Twentieth Anniversary Edition, UC Press), winner of the John Burroughs Medal; The Bonehunter's Revenge: Dinosaurs, Greed, and the Greatest Scientific Feud of the Gilded Age; and The Monkey's Bridge: Mysteries of Evolution in Central America, A New York Times Notable Book.